Candace H. Johnson Nancy Hildebrandt, director, works with her client, Rachel Reich, of Grayslake, on a side plank during a small group training session at Pinnacle Fitness in Libertyville. 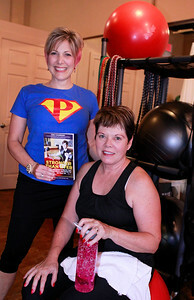 Candace H. Johnson Nancy Hildebrandt, director, holds her book, "Stronger Than Ever," with one of her clients, Jane Collins, of Libertyville at Pinnacle Fitness in Libertyville. Collins is featured working out on the cover of Nancy Hildebrandt's book. 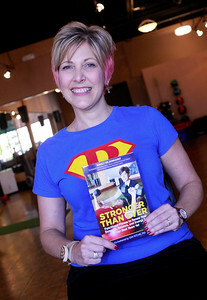 Candace H. Johnson Nancy Hildebrandt, holds her book, "Stronger Than Ever," at Pinnacle Fitness in Libertyville. Candace H. Johnson Nancy Hildebrandt's book, "Stronger Than Ever." 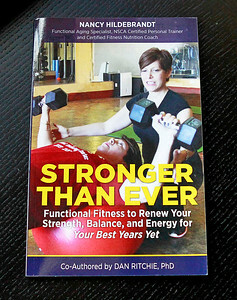 The author is the director of Pinnacle Fitness in Libertyville. 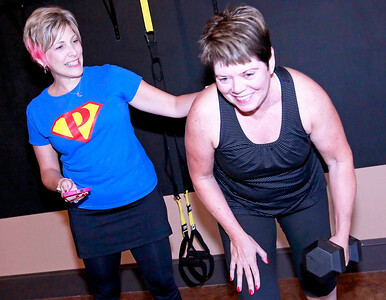 Nancy Hildebrandt, director, works with her client, Jane Collins, of Libertyville, as she lifts weights during a small group training session at Pinnacle Fitness in Libertyville.